(Aug. 8, 2009) — For about a year, there have been nagging questions about the eligibility and citizenship of Barack Hussein Obama, Democratic hopeful, and subsequently the party nominee, the President-Elect and the currently recognized US President. While nearly all of the key questions about Obama regard his citizenship, the one that invites the most avid interest is the place of his birth, and in particular, the allegation that he was born in Mombasa, Kenya. The kernel of this allegation is this: that Sarah Obama, the third wife of Obama’s paternal grandfather, was present at his birth, in Mombasa, on Aug. 4th, 1961. This allegation is based on a telephone interview done by Bishop McRae, of the North American Anabaptist Church, with the assistance in Kenya of a fellow missionary and native translator. This interview and affidavit were made available to Philip Berg (www.obamacrimes.com), former assistant Attorney General of Pennsylvania, Democratic party member, and litigant for several law suits in Federal Courts regarding the eligibility and citizenship of Barack Obama Jr.; and it is he who has principally made them known to the public. World Net Daily (www.worldnetdaily.com), an Internet News Site run by Joseph Farah, recently gave wider publicity to this interview (see below for links to video and audio of this interview with Sarah Obama). Understanding that you don’t solve research questions with law suits, I decided to investigate the claims put forward by those who have listened to this interview and read its transcript, to see what basis of authority they have. For this purpose I tracked down Mr. Leo Odera Omolo an old friend of the President’s father, and interviewed him by email, regarding what Sarah Obama said. What follows is a nearly verbatim reprint of our conversation, with only those minor changes made for American usage and spelling. MR. CHARLTON: Dear Mr. Omolo, thank you for your detailed report on “Mama Sarah” Obama at http://blog.jaluo.com/?p=1831. It is this report which has led me to ask you if you would grant me an interview, regarding some questions I have about Mama Sarah. there is an audio interview, where a Missionary from the Anabaptist Church of Kenya spoke with Mama Sarah. In this interview Mama Sarah says that Barry Obama, the US President, was born at Mombasa, Kenya, and that she was present for his birth. MR. OMOLO: Surely I do not want to become part of your argument nor do I wish to get involved in the Obama affairs in anyway. What I wrote about Mama Sarah Obama should be taken in the face of it as a news item, and does not obligate me to conduct any research for further information .OK.? MR. CHARLTON: Thank you for your response. However, I am not asking you to get involved in any way; I am trying to find someone in Kenya who has met Sarah Obama and can recognize her voice, and speak her language…that is why I wrote you..
MR. OMOLO: Yes if that is the case I am willing to assist you. I know Mama Sarah pretty well and intimately and I am a friend of the late Barrack Obama snr since our youths, as well as his later drinking partner. Just mail the voice and I will help. What I am not keen on is those pestering me with looking for stories for the purpose of writing or publishing books on the late Barry. Just click that link with a web browser which allows for audio files to be played. MR. OMOLO: I have taken a very keen interest and have carefully listened to the interview. The voice is truly of the of Mama Sarah Hussein Obama, although her interpreter was not doing a perfect job in correctly translating her words into English. The interviewing Bishop, too was wrong for having offered to bring Mama Sarah a copy of the Bible, and yet Mama Sarah is professing Muslim faith. He perhaps irritated her towards the end of the interview. The Bishop, again, appears to have some preconceived ideas that Barack Obama jnr, the US President, was born in the Kenya’s coastal City of Mombasa, as some mischievous writings (claim), which have appeared in the US. papers and websites. Take from me. I was born on July 21,1937 whereas Barrack Obama Snr was born a year earlier in 1936, but because of my huge stature, we were almost of the same size. I knew all his background pretty well. His son who is 44th US President was born in Hawaii and not Kenya, and whoever is saying he was born in Mombasa is making fraudulent claims for some unclear motives only known to himself. Do not shy away from asking me more (questions). OK? MR. CHARLTON: Thank you for this valuable information, and the kindness of your reply and offer of openness. I have always had a personal interest in Kenya, and the fact that my president has Kenyan roots has led me to do a lot of reading in the last 9 months about Kenya. As far as I can tell, the rumors that our President was born in Mombasa all trace back to this interview with Sarah Obama. And a good number of those who listen to this interview and read its transcript are convinced that it was she who said the word Mombasa. I am sure you understand, that for us in the United States, what Sarah Obama says is important: we value the testimony of our grandmothers, even more than what we find on written documents. That is why many regard this interview as something important. I myself do not know Swahili; but I am trying to figure out why the word Mombasa was said by Sarah. Someone suggests that she was talking about being in Mombasa when she heard of the birth of Barry jnr; others that she was in Mombasa for the birth of some other family member, or that one of her biological children was born in Mombasa. This interview if properly explained could clarify much. I would hope that you could explain or ask Sarah Obama to explain why she said Mombasa in response to the question. To whom or what was she referring. From the interview it does not seem that someone suggested “Mombasa” to her. It does not make sense to me. You know, rumors thrive in ignorance. Since you are a personal friend of the late Barack Obama Snr, I hope you can shed some light on this. MR. OMOLO: From the script you posted to me and according to my understanding of both the Dho-Luo vernacular and Kiswaili, Mama Sarah Obama was being pinned down with the question whether she herself was present—where—and the place where the boy was born. She replied in affirmative, that she wasn’t there herself because she happen to be in Mombasa at the material time, whereas the little baby grandson was born in Hawaii in the United States of America, therefore she could not have been there to witness his birth. Thus us what the script is telling. The same as I know the history of the family, there is nothing that can connect his birth to Mombasa. I have only read on a website of a Muslim Sheikh trying to tell the world that Obama was born in Mombasa, Kenya and not in the United States. But I had simply dismissed it as meant for electioneering campaign in the US and therefore not a big issue. The story was highlighted by the API, an online news site, published in Oslo Norway, by one who is now living in self imposed exile in that country, and who was totally opposed to Barrack Obama being elected the US President for tribal reasons. MR. OMOLO: Sir, the family of the late Hussein Onytango Obama are devout Muslims and so is the family of Sarah Obama. Half of the sons of the late Mr. Abdo Omari, Sarah’s father, live at Kendu-Bay, while half of the family members are living in Mombasa, a Swahili coastal town whose inhabitant are the Muslim. It was her husband, Hussein Onyango Obama, who received the telegram message from his son Barrack Obama snr, from Hawaii, announcing the birth of a bouncing baby son, who Barrack was found of calling “the Big Bull”, and who is the now US President. In turn, Hussein Onyango called his wife Sarah in Mombasa and to break the good news from Hawaii in the US. And that is how Sarah came to know about the new baby. Barrak Obama had no money for the airfare of his family (to bring them) from Hawaii, in the United States, to Kenya, at the material time. Due to that acute shortage of funds, he befriended Ruth, a primary (school) teacher near Harvard University when he attended the College for his master’s degree studies. The reason why: Ruth was working and had the money the two of them could use when socializing around. And this also became the source of his divorce with Ann Dunham, the late mother of Barrack Obama, now the US President. The news got leaked to Ann that Barrack was semi co-habiting or frequently seen in the company of Ruth, and that is their divorce came about. MR. CHARLTON: Thank you, Mr. Omolo, for your time and willingness to be interviewed by The Post & Email. 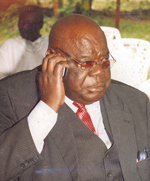 About Mr. Omolo: Leo Odera Omolo is a veteran Kenyan journalist with a wealth of experience dating back to 1959. He has served in many media houses in Kenya, and at time acted as foreign international correspondent for various newspapers abroad and radio stations. He is also the author of many childrens books in both Kiswahili and English. He can be reached by phone in Kenya at 254-0722-486181 or 0734-509215 at the same area code. He also writes for the Jaluoi.com online news site and many other publications. The Post & Email asks you to respect Mr. Omolo’s privacy, and only contact him for professional reasons. Editorial: Aug. 28, 2009 — The Mystery Behind "Barack"